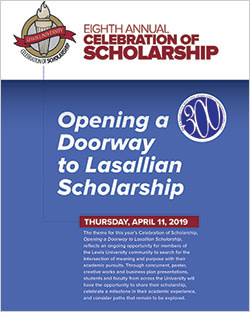 "Opening a Doorway to Lasallian Scholarship"
The Lewis University Celebration of Scholarship is a symposium to celebrate research, scholarly work and creative endeavors of Lewis students and faculty. Work created in 2018 and 2019 will be eligible for consideration. This on-campus symposium is a rich opportunity for both students and faculty to present scholarly work to a student, faculty, and staff audience in celebration of the academic excellence that is central to the Mission of the University. Undergraduate and graduate students in all disciplines are encouraged to submit posters, present at a concurrent session, or share a creative work. New this year: Undergraduate students are invited to submit their applications representing completed projects to be considered for the Dr. Stephany Schlachter Excellence in Undergraduate Scholarship Award. Details about eligibility can be found here. With Lewis University in its 9th decade, it is fitting that we communicate across the campus the ideas and scholarly work that is shared every day in the classroom. Follow this web site for continued updates throughout the coming months. All student projects must be developed under direction of a faculty mentor. If you have any questions, please consult with your faculty mentor. Submissions require formal approval by your faculty mentor. Learn more about what to expect from a scholastic symposium, eligibility, deadlines for application, and tips for successful participation. 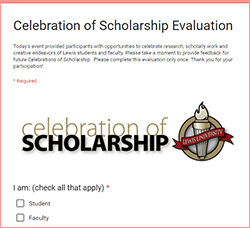 Scholarship takes many forms and occurs in every academic discipline. This will help you determine the best presentation format for your work and prepare a strong application.